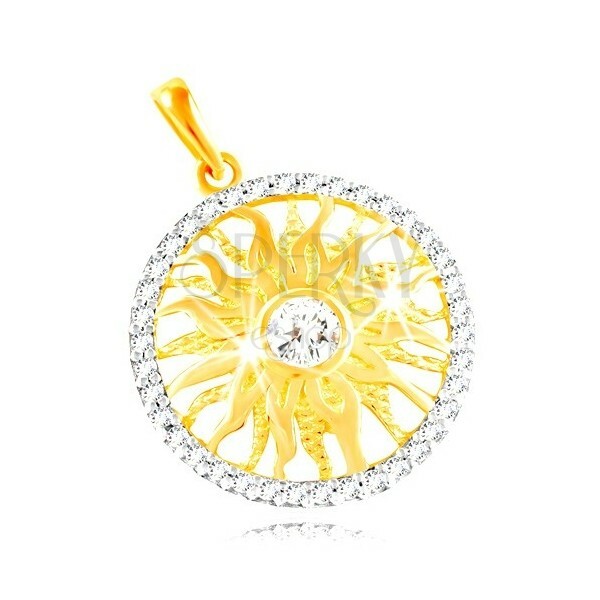 14K gold pendant - circle contour decorated with white gold and imbedded clear zircons, sun with curved rays and a zircon. By buying this product you can collect up to 55 points as a voucher of 11,00 €. Your reward points. Pendant in combined 14K gold has the shape of a sparkling band which is decorated with a layer of white gold and imbedded zircons in clear colour. Inside the band is placed a sun with bigger clear zircon in the middle. The sun rays are slightly curved with alternating rays with smooth and engraved surface. 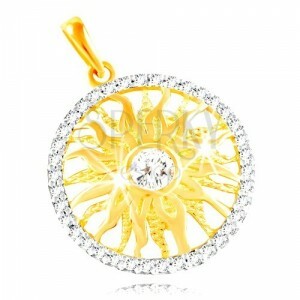 The eye for the chain has an elongated shape and it widens slightly towards the top.